Welcome to the newly opened Comfort Hotel Kista. Guests can look forward to 194 modern hotel rooms, a barception, large lounge and gym, as well as an ideal location near Kista Galleria and Kistamässan, just 18 mins by metro from central Stockholm. Welcome to the newly opened Comfort Hotel Kista. Guests can look forward to a new and exciting hotel right in the heart of Kista, just 18 minutes from central Stockholm. The hotel has everything you might need, but without any unnecessary extras. And thanks to the well-stocked Barception (bar+reception) in the lobby, there's no need for room service or minibars. Come here to check in, enjoy a bite to eat, have a beer or get some work done. We also serve a healthy breakfast every morning to get your day off to a great start! 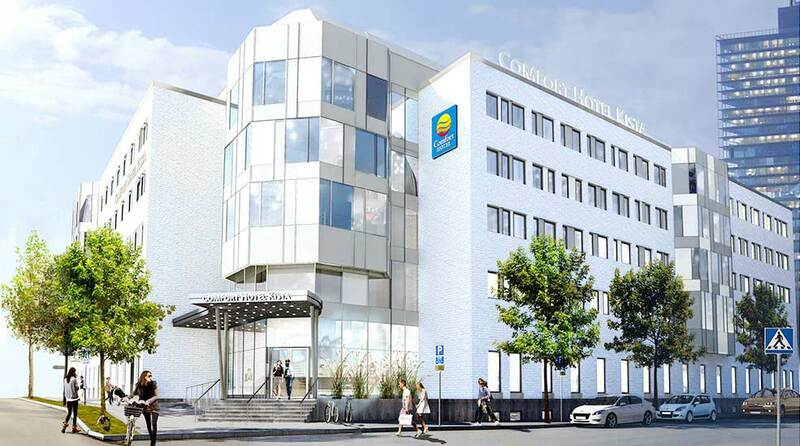 The Comfort Hotel Kista is an ideal place to stay for all those planning a visit to the Kistamässan events venue or a company in Kista or Solna. The hotel is located right next to the Kista Galleria shopping mall where you’ll find a great range of shops, eateries, a cinema and lots more to keep you entertained! The Comfort Hotel Kista is within easy reach of both Bromma and Arlanda airports, and it takes just 18 minutes to get to central Stockholm by metro. The commuter train station is about 10 minutes’ walk away and you can take trains into the city or to Arlanda Airport from here. You’ll be close to everything in other words! Comfort Hotel places great emphasis on serving food that is tasty yet simple. We also like to make sure that it is good for you and the environment. Come down to the Barception to enjoy lunch, dinner, snacks, biscuits, coffee and other goodies. Breakfast here at the Comfort Hotel Kista is a hybrid between a classic hotel buffet and a café breakfast. We do our bit for the planet by providing you with just what you need without any unnecessary extras. You can view all our services here. The Comfort Hotel Kista has different rooms for different needs. Perhaps you’re travelling alone? Maybe you’re a large family or a group of friends looking for a large room? Whatever your needs, we’ve got it covered. Choose between single rooms, double rooms and XXL rooms that can accommodate up to 8 people. We also have eight accessible rooms that are specially adapted for people with disabilities. You’ll soon be able to book rooms right here – keep checking this page for the latest news. The ground floor is spacious and inviting. This is a great place to do some work, hang out with friends and colleagues, have a bit to eat, or just sit back and relax with a beer. There’s room for everyone in our lobby! Do you like clean and crease-free shirts? Do you hate to miss a workout? Don’t worry! Here at the Comfort Hotel Kista both our laundry room and gym are open 24 hours a day. There is free wireless internet access all over the hotel You can even use a network cable to get online if you prefer. Arlanda Airport, 30 km, 20 min by car / taxi. The airport buses from Kista to Arlanda take 29 minutes. Bromma Airport, 8 km, 10-15 min by car / taxi. Kista subway, 500 metres. The blue line towards Kungsträdgården takes you to Stockholm city in 18 minutes. Helenelund commuter train station: 1200 metres.